Palmyra’s Phoenix 15 Studio hosting painting event in support of Relay for Life. 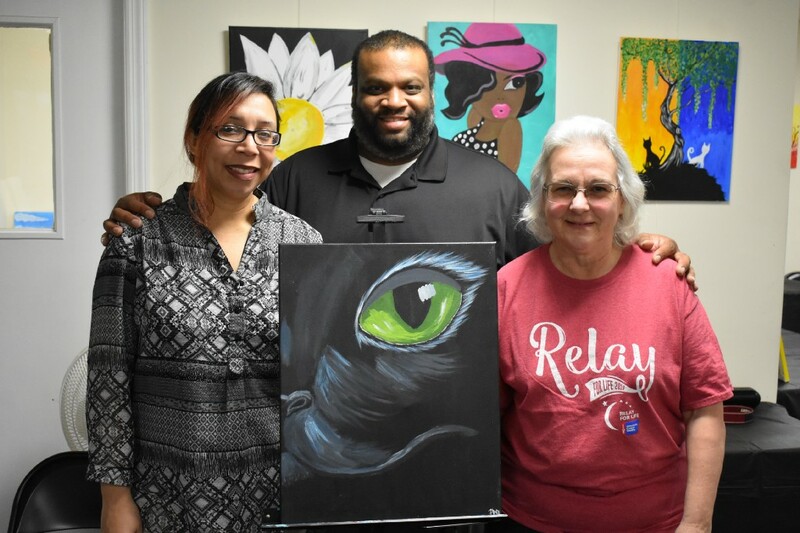 From left, Frances Davis, Gene Davis and Jeanie Klein stand with the piece attendees will be painting at the upcoming fundraising event at the Phoenix 15 Art Studio in Palmyra. Palmyra resident Jeanie Klein has a passion for fundraising when it comes to causes she believes in. Through the years, she has raised money for leukemia and junior diabetes research and the American Heart Association, and has participated in Making Strides Against Breast Cancer and the Cooper Norcross Run the Bridge event. As if all of that wasn’t enough, she co-chairs the committee for her local Relay for Life events and has been raising money for the American Cancer Society for the past 10 years. Klein was hooked after participating in her first Relay for Life event. “It inspired me to get more involved, so I did. I was so impressed, there were all these adults and kids of all different ages up all night long selling cookies, eating, talking, having a good time. It was awesome,” said Klein. According to Klein, the driving force behind her fundraising has been the loss of a former co-worker, who passed away before a fundraising event meant to raise money for her cancer treatments. “She left two little kids, and it just broke my heart,” said Klein. Klein organizes fundraisers on a monthly basis and is currently fundraising for the next Relay for Life in September on the Cinnaminson High School track. On Saturday, March 30, she is teaming with Phoenix 15 Studios in Palmyra for a fun and unique fundraiser. This will be her third time teaming with the art studio, owned by residents Frances and Gene Davis. “I’m the one who does all of the artwork, and he does the marketing,” said Frances. At the Paint This event, Frances will lead attendees in painting a close-up portrait of a black cat. She promises the event will be very beginner friendly. According to Frances, many people who come to the studio for paint night events have never tried painting before. “They’re shocked by the time the class is over that they were able to accomplish something that they didn’t know how to do before,” said Frances. The event is BYOB and will feature basket raffles. All proceeds will go toward the upcoming Relay for Life event. Frances promises lots of fun and an opportunity for people to give to a good cause. The painting fundraising is taking place Saturday, March 30, from 1 to 4 p.m. Tickets are $30 and include pizza and all art supplies participants will need. Phoenix Studios is located at 100 E. Broad Str. in Palmyra. To purchase tickets, visit the studio’s website at phoenix15studios.com.